Many people ask us how this blog came to be, so let’s step into the Way-back Machine and take a journey through time. In 1998, I'd just moved to LA from SF to take a job working for a relative and he was pretty much the only soul I knew in this ginormous city. I'd spend my Friday and Saturday nights flipping through the LA Weekly in search of social gatherings, concerts and events I could attend on my own, without looking like a total loser. On one of these auspicious evenings, in the back pages near "Missed Connections," I found a tiny ad recruiting members for a book club. I'd been in a book group in SF and enjoyed pontificating about authors’ prose and gossiping over finger foods. "Perfect!" I thought. Maybe I'll meet some intellectuals or, at the very least, cute guys who like to read. The first meeting had about ten people in attendance and Suzy Gruyere was one of them, sporting groovy vintage eyewear and wielding a sharp wit. Naturally I planted myself right next to her. I don't remember any cute guys but that might have been because Bridget Jones' Diary was the first selection, or maybe it was that Suz was so riveting, I ignored everyone else. As luck would have it, that book club was a bit of a bust, it only takes one crazy person to ruin the whole bunch, but Suz and I became fast friends sharing a love of music, Karaoke, making art stuff, and comfort food. There was a stint where we lost touch due mostly to geography. Living on opposite ends of this town made it difficult to stay in touch as many Angelenos know. But then Facebook came along, providing a daily means to connect, and plans were forged to get together in person and eat mac and cheese, of course. We did this because it's delicious and narrows the restaurant choices. If the joint had mac on the menu and/or Karaoke, we'd be there. (We are still searching and praying for a cool bistro that caters to both of our obsessions – Karaoke mac and cheese parlor, anyone?) After a few mac dates, I teased that we should put our findings into a blog, and in the way that only a kindred spirit can do, Suzy took my nutty idea completely seriously and TA DA, back in June, http://www.weheartmacandcheese.com was born. Last weekend we hosted the first official Mac Attack Potluck Competition. Friends brought over their favorite mac and cheese creations to be evaluated by an army of comfort food aficionados. 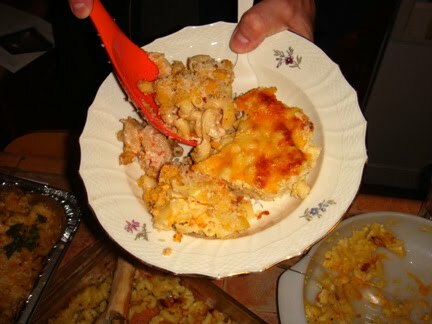 There were fifteen varieties of mac and cheese entered into the contest and several stand outs that received top honors. You might wonder, how different can one mac and cheese be from another mac and cheese? Very different, in fact! There were interesting add-ins like pancetta, chile peppers, garlic and a multitude of cheeses. And our guests took this contest very seriously, spending time considering and debating the merits of each dish. "Strange to wander and overhear people discussing mac and cheese with the same highfalutin vocabulary and seriousness of purpose that H and I use," Suzy G noted. We'll be dedicating the next several blog posts to this event so stay tuned for prize winning recipes and event "how to" and "how not to" tips.